Neuroinflammation is considered one of the cardinal features of Alzheimer’s disease (AD). Early observations of neuritic plaques composed of amyloid β and neurofibrillary tangle-laden neurons surrounded by reactive astrocytes and microglia [1–4], as well as evidence that microglia exposed to amyloid β release proinflammatory factors such as interleukin 1 beta (IL-1β) and tumor necrosis factor alpha (TNFα) [5–7] that in turn could modify AD pathology [8–12], led to hypotheses positing chronic neuroinflammation as a driving feature of AD . Subsequent investigations revealed a more complex picture, with increased recognition of factors and cell types involved in neuroinflammation, including the influence of peripheral immune mediators and their effects on AD pathology and associated cognitive function in animal models. These findings related to the role of neuroinflammation in AD have been reviewed in multiple articles [14–18]. In this review, we focus on the interplay between factors and cell types associated with neuroinflammation, including cytokines, microglia, and peripheral immune mediators, as well as some clinical studies, to describe how modulation of such processes might be exploited for prevention or treatment of AD. Concentration of various proinflammatory cytokines including IL-1β, IL-6, IL-12, IL-18, and TNFα and anti-inflammatory cytokines such as interleukin-1 receptor antagonist (IL-1RA) and IL-10 have been found to increase in cerebrospinal fluid (CSF) of AD patients, pointing to an immune disturbance [19–22]. Whether production of these cytokines initiates AD or results from neurodegeneration and neuritic plaque deposition has not been conclusively demonstrated in humans. Murine models of AD have been useful in testing the effects of various cytokines on amyloid β and tau pathology. In general, most studies have found that overexpression of pro-inflammatory cytokines leads to a reduction of amyloid β plaque, possibly through microglial activity [10, 23–25]. Nonetheless, proinflammatory factors, such as IL-1β, IL-6, and TNFα, have also been shown to worsen tau hyperphosphorylation and thus could contribute to neurofibrillary tangle formation [8, 11, 26]. In addition, genetic studies have demonstrated that polymorphisms in various cytokines, such as IL-1β, IL-6, IL-12, IL-18, and TNFα, and cytokine receptors, such as the IL-1 receptor accessory protein, are associated with an increased risk of developing AD [27–29]. While the risk of developing AD due to these mutations is modest, they can hasten disease progression when concomitantly present with variants of apolipoprotein E (APOE) that are associated with late-onset AD . Thus, cytokine production could be a potential therapeutic target to slow the progression of sporadic AD. There is a possibility that AD progression is partially due to a dysregulation of sterile inflammation, such as the one that is induced in the brain with amyloid β accumulation. One of the components of the sterile inflammatory response is the formation of a multiprotein complex called the inflammasome, which is critical to convert precursors of IL-1β and IL-18 to the biologically active cytokines . Fibrillar amyloid β has been shown to bind NOD-like receptor protein 3 (NLRP3), one of the pattern recognition receptors that regulates inflammasome formation in microglia and induces IL-1β production . Deletion of NLRP3 ameliorated amyloid β pathology and improved cognitive impairment in APP/PS1 mice , perhaps by reducing cross-seeding of amyloid β . Administration of NLRP3 inhibitors have decreased cerebral amyloid β and improved cognitive function in amyloidogenic models making inflammasome formation a promising therapeutic target [34–36]. Further discussion of the role of inflammasomes in AD and neurodegeneration can be found in recent reviews [37–39]. In addition to the proinflammatory changes that occur with aging and AD, there is evidence to suggest a dysregulation in anti-inflammatory pathways. Immunohistochemical studies have revealed that the neurotrophic factor TGF-β2 is localized in reactive astrocytes and microglia surrounding neuritic plaques . In addition, increased concentrations of TGF-β2 have been detected in the AD patient CSF . Expression of this cytokine in reactive glia may represent an attempt to curb the inflammatory response initiated by amyloid β accumulation. In AD patients, neuronal TGF-β2 signaling may be blunted due to decreased expression of TGFβRII that is present even in prodromal stages of AD . Like proinflammatory cytokine modulation, overexpression of anti-inflammatory cytokines, such as IL-4, IL-13, and TGF-β1, has been shown to decrease amyloid beta plaque [43–45]. Stimulation with anti-inflammatory cytokines alternatively activates microglia, upregulating markers such as arginase 1 and YM1. One group demonstrated that hippocampal arginase 1 overexpression in rTg4510 tau transgenic mice led to a decrease in tau phosphorylation . Amyloid β can exist as soluble oligomers or insoluble fibrils of the proteolytic products Aβ 1-40 or 1-42. While attention has largely focused on studying the effect of insoluble fibrils on neurons and glia, amyloid β oligomers are also thought to contribute to disease pathology. Aβ 1-42 oligomers, more so that Aβ 1-40 oligomers, have been shown to be neurotoxic and can elicit acute microgliosis and impairment in long-term potentiation when injected into the brain of wild-type mice [51, 52]. Furthermore, microglia are capable of phagocytizing all forms of amyloid β, including soluble oligomers . Interestingly, the response of microglia to amyloid β is different depending on whether it exists as soluble oligomers or fibrillar plaques. In an in vitro study, oligomers stimulated increased levels of phagocytosis markers including activated Lyn and Syk kinase as well as p38MAPK compared to fibrils . In addition, microglia treated with oligomers increased the production of cytokines IL-6 and CCL2 when compared to fibrils [54, 55]. Some investigators have considered amyloid β plaques to be a relatively benign aggregation of amyloid β that microglia contain to protect the brain from the more neurotoxic oligomers [56–58]. The ability of microglia to surround and phagocytize amyloid β plaques depends on the microglia-expressed gene Trem2. This gene encodes a protein called triggering receptor expressed on myeloid cells 2 that is expressed by innate immune cells. Among the functions of TREM2 are regulation of immune responses, expression of constitutive cytokines, and microglial response to neuronal injury [68, 69]. Mutations in TREM2 have been identified as a risk factor for the development of late-onset AD [70–72]. Mice deficient in TREM2 tend to have diffuse, irregularly-shaped plaques with multiple hotspots of Aβ 1-42 polymerization [73, 74]. Furthermore, these plaques were associated with increased neurodegeneration when compared to TREM2 sufficient mice . In addition, TREM2 deficiency induced inflammation shown by an increase in IL-1β secretion and Iba1 staining in microglia [73–75]. 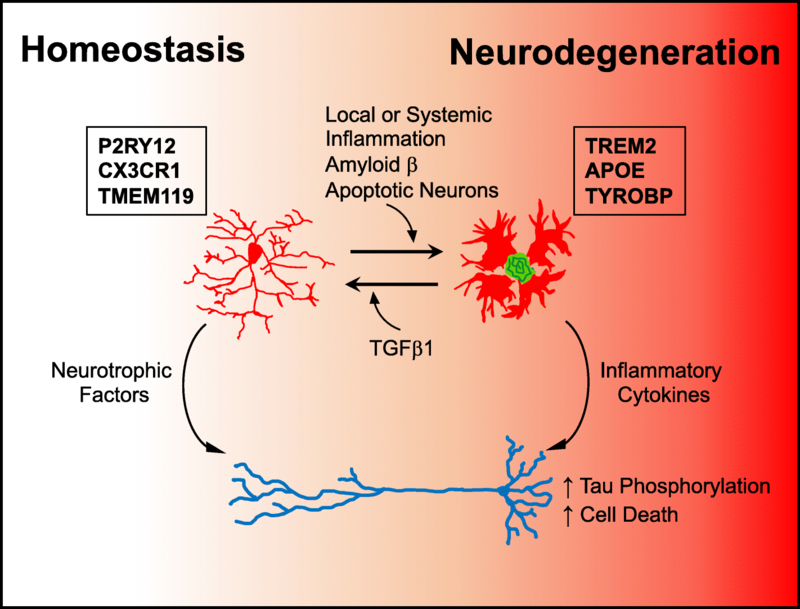 Possibly because of the increase in neuroinflammation, TREM2 deficiency also exacerbated tau hyperphosphorylation in a tauopathy murine model . These findings suggest that TREM2 activity regulates the inflammatory response by microglia and thus might be a target for modulation of their activation. Microglia can also acquire an anti-inflammatory, neuroprotective phenotype in the context of AD. Evidence of the anti-inflammatory mechanisms in AD comes from studies that manipulated the neuroinflammatory environment in AD mouse models. Induction of neuroinflammation through acute intra-cortical lipopolysaccharide (LPS) injection or IL-1β overexpression in the hippocampus not only increased the number of proinflammatory nitric oxide synthase (iNOS) positive microglia, but also induced the expression of anti-inflammatory marker arginase 1 in some microglia [26, 45]. Interestingly, arginase 1-positive cells appeared to be better phagocytes of amyloid β when compared to iNOS-positive cells and IL-1β-dependent plaque clearance was inhibited using antibodies against the IL-4 receptor (IL-4Rα) . Intrahippocampal injection of anti-inflammatory cytokines IL-4 and IL-13 also induced arginase 1 expression and reduced pathology in amyloidogenic murine models [44, 45]. Arginase 1 overexpression alone was able to cause a reduction in tau hyperphosphorylation, while arginase inhibition led to an increase in tau pathology . What predisposes some microglia to move along the spectrum of proinflammatory and anti-inflammatory phenotypes in the context of AD is currently unknown. In spinal cord injury, inflammation induces expression of IL-4Rα and IL-4 mRNA . Interestingly, IL-4 signaling correlates with not only an increase in arginase 1 signaling but also an increase in IL-1β and CCL2 expression that is not present in a microglia-specific IL-4Rα knockout mouse . While initial studies sought to categorize these cells into either proinflammatory M1 cells or anti-inflammatory M2 cells, the reality is that microglial phenotypes show greater diversity during development and pathology [78–81], and the use of this simplistic nomenclature has been discouraged [82, 83]. The central nervous system is considered an immune-privileged organ due to the blood-brain barrier (BBB) and the relatively low number of surveilling peripheral immune cells found within the brain parenchyma. Nonetheless, in the context of the chronic neuroinflammation that is present in AD, there is some evidence to suggest that peripheral immune cells infiltrate the CNS and accumulate near areas of pathology [94–96]. These peripheral immune cells include monocytes, which are highly phagocytic cells that migrate into areas of injury and proliferate and differentiate into macrophages to clear pathogens or cellular debris. Evidence suggests that inducing neuroinflammation in amyloidogenic mouse models by acute LPS injection or IL-1β overexpression leads to an increase of Ly6c+ CCR2+ monocyte migration into the central nervous system [97, 98]. Some studies have shown increased numbers of grafted monocytes associated with amyloid plaques in chimeric models and a dependence of amyloid clearance on the recruitment of CCR2+ cells [99–101]. Nonetheless, CCR2 knockout does not have an impact on IL-1β-induced clearance of amyloid β plaque by resident microglia and recent chimera studies that did not employ irradiation have shown very little evidence of migration . Perhaps these monocytes could serve as a backup to resident microglial populations if the offending stimuli persist . Interestingly, intracerebrally injected mesenchymal stem cells derived from the bone marrow or adipose tissue significantly reduced amyloid beta deposition and enhanced cognitive function, apparently by decreasing neuroinflammation [103, 104]. Thus, this pool of cells could be exploited to substitute for senescent microglia when they fail to slow AD progression [93, 105]. There is evidence to suggest migration of T lymphocytes into the brain of AD patients [106, 107]. As already noted, stimulation of microglia with amyloid β plaques in transgenic mouse models or injection of Aβ 1-42 oligomers lead to the release of proinflammatory cytokines such as IL-1β and TNFα. In vitro and in vivo studies have shown that these cytokines promote the production of chemokine CXCL8 by endothelial cells [108–111]. Interestingly, T cells of AD patients are enriched in the chemokine receptor CXCR2 which, upon binding to CXCL8, promotes T cell transmigration across endothelial barriers, including the blood-brain barrier . This movement through the BBB was inhibited by anti-TNFα antibodies or inhibition of CXCR2 on T cells . Other studies in rodent models have shown that once in the brain, T cells can modify microglia phenotype, increasing their motility and phagocytic activity through secretion of IFN γ . Potentially, microglia could phagocytose and present amyloid β to T cells as a form of re-stimulation . Whether this mechanism occurs in humans with AD and to what extent it is utilized remains an open question. Interestingly, RAG1 and RAG2 knockout mice, which lack B and T lymphocytes, demonstrated worse cognitive capabilities when compared to wild-type mice and increased amyloid β plaque deposition and microglia activation in amyloidogenic models [115, 116]. Nonetheless, these approaches have not yet teased out the specific contributions of different lymphocyte subtypes, which might explain differing results in some cases . In contrast to findings with cytotoxic T cells, T helper cells have been much more closely implicated in the response to AD pathology . Th1 cells are responsible for promoting cellular responses to offending stimuli by activating macrophages and CD8+ T cells and their effector cytokine is IFNγ . Contrastingly, Th2 cells are responsible for promoting humoral immune responses by inducing antibody production by B lymphocytes and some of their effector molecules are the anti-inflammatory cytokines IL-4 and IL-10, which inhibit Th1 responses . In the context of AD, T helper cells have been shown to modulate microglial responses through contact or release of cytokines. Research into Th1 cells and IFNγ demonstrates that these cells can migrate into the brain parenchyma after immunization with Aβ 1-42 [95, 121, 122]. What they do once in the CNS is the subject of controversy. Some have argued that Th1 cells activate microglia to increase amyloid β clearance [113, 123], while others have claimed they increase pathology through IFNγ release . This microglial activation also makes their processes more motile, which might help microglia encounter and surround amyloid β plaques more efficiently . Interestingly, contrary to other proinflammatory cytokines, such as TNFα and IL-1β, overexpression of IFNγ using an AAV vector led to decreased tau pathology and increased neurogenesis . However, the immune response of Th1 cells has been closely associated with the onset of meningoencephalitis in human subjects injected with an Aβ 1-42 vaccine, providing clear evidence that these cells increase proinflammatory responses [121, 125]. In contrast, induced Th2 cells may modulate glial responses with limited infiltration of the CNS, instead of acting from the choroid plexus or meningeal spaces [126–129]. Rodent studies have shown that when amyloid β specific Th2 cells are injected into the periphery, they modulate the cytokine profile of transgenic mice towards a more anti-inflammatory one by decreasing GM-CSF, TNFα, and IL-2 levels . This peripheral modulation has been correlated with decreased microgliosis that is accompanied by improved cognitive performance . Furthermore, Th2 cell activity might induce the promotion of Aβ 1-42 autoantibodies . In addition, others have proposed the use of the relapsing-remitting multiple sclerosis drug Copaxone or glatiramer acetate (GA) to treat AD [141–143]. GA is a mixture of peptides composed of the four amino acids found in myelin basic protein: glutamic acid, lysine, alanine, and tyrosine. While the mechanism of action of GA is still debated, evidence suggests that it is a stimulator of the Th2 response, which is beneficial in combating relapsing-remitting multiple sclerosis, possibly by suppressing the inflammatory, Th1 response [144–146]. Evaluation of serum and CNS of GA-treated mice showed increased levels of the anti-inflammatory cytokine IL-10 and brain-derived neurotrophic factor (BDNF), both of which are produced by activated Th2 cells [147–149]. In addition, not only has GA been effective in decreasing pathology in models of experimental autoimmune encephalomyelitis, but it has also shown benefits in Huntington’s disease models [149, 150]. GA use in amyloidogenic mouse models successfully reduced plaque load; however, the effects of GA on tau pathology remain untested [141–143]. Systemic infection and inflammation in individuals with AD is associated with worse cognitive function and reduced hippocampal volume [153–155]. Specifically, high serum levels of inflammatory cytokines like IL-1β and TNFα are associated with disease progression. In addition, some have shown that systemic infection is associated with an increased risk of developing AD [33, 156]. Induction of systemic disorders such as osteoarthritis in APP/PS1 mice led to glial activation and exacerbation of amyloid pathology . After peripheral infection of APP/PS1 mice with the respiratory pathogen Bordetella pertussis, increased brain infiltration of IFNγ and IL-17 producing T cells and natural killer cells was observed that correlated with increased glial activation and amyloid β plaque deposition . Both of these rodent studies highlight the interconnections between the peripheral inflammatory state and the CNS. It is clear that changes in concentrations of peripheral cytokines and infiltration of peripheral cells can have lasting effects on the response of microglia to AD pathology. Microglia are incredibly sensitive to perturbations in the brain environment by peripheral stimuli including inflammation and infections. Several studies have utilized intraperitoneal injections of bacterial LPS to evaluate the effects of infection in AD [159–164]. In a recent study, peripheral LPS induced microglial activation and phenotype changes, including an increase in markers of disease-associated microglia, such as APOE and CLEC7A [88, 165]. LPS administration also increased accumulation of amyloid precursor protein and its cleavage product amyloid β early in disease [159, 166]. Another study found that this accumulation of amyloid β was exacerbated by an altered amyloid β efflux through the BBB in a low-density lipoprotein receptor-related protein 1 (LRP1)-dependent manner . Interestingly, while a single LPS injection increased pro-inflammatory cytokines in the blood and brain , a persistent inflammatory tone established by sequential LPS injections can lead microglia to become more tolerant of inflammatory stimuli and dampen their response . This last study also found that mice that had tolerant microglia also had lower levels of cerebral amyloidosis. Activation of TLR9 with a peripheral injection of CpG oligodeoxynucleotides led to a reduction in both amyloid β and tau pathology in murine models of AD and thus could be beneficial [183–185]. TLR9 has been shown to regulate autoimmune responses in models of systemic lupus erythematosus ; therefore, it is possible that TLR9 in particular may regulate the inflammatory response in the context of AD, promoting an environment that leads to tissue repair. Taken together, there are many examples showing that alteration of peripheral inflammation by infectious agents or injections of cytokines or TLR ligands can have profound effects on brain AD pathology. More studies are needed to define mechanisms of CNS immunomodulation by peripheral factors. Nonetheless, the identification of such modulators is a promising and exciting route for therapeutic discovery. A recent review article by Jeffrey Cummings provides a comprehensive summary of immune-related and other therapeutics currently in the AD drug development pipeline . Observational studies, such as case-control and incidence studies, have shown that regular use of non-selective NSAIDs is associated with a reduced relative risk of developing AD [188–191]. The majority of individuals followed in these observational studies suffered from an inflammatory condition, such as rheumatoid arthritis, which explains their long-term NSAID use. Thus, the cohorts observed in these studies only represent a proportion of the population at risk of developing AD. A review article by Imbimbo et al. has delineated the following general trends of risk reduction found in observational studies: (1) risk was modified by the length of time NSAIDs were used with the lowest risk being associated with 2 years of use, while no effect was detected with 1 month of use; (2) the type of NSAID use, with non-aspirin NSAIDs having a higher risk reduction when compared to aspirin, an irreversible COX inhibitor; (3) NSAIDs that were found to be effective at reducing risk of AD also have been shown to decrease levels of Aβ-42 in murine models of AD such as ibuprofen, indomethacin, and diclofenac. Unfortunately, randomized control trials (RCT) have found that the use of naproxen, diclofenac, or indomethacin, all of which have been shown to reduce AD risk in epidemiological studies, do not slow down the progression of AD when compared to placebo [192–194]. One of the challenges for these trials was the dropout rate of subjects due to gastrointestinal issues brought on by chronic NSAID use. In order to prevent side effects, some RCTs minimized the daily dose of NSAID administered to the treatment group, which might potentially explain the negative results . Trials utilizing COX 2 selective NSAIDs like celecoxib and rofecoxib, which are less likely to cause gastrointestinal issues, but retain risks for deleterious cardiovascular events, have failed to demonstrate positive treatment benefits for AD or mild cognitive impairment [195, 196].